Washington, DC (March 14, 2019) – Docket Alarm by Fastcase, a leader in litigation analytics and docket research, today debuted “deadline display” – a new docket feature that extracts and exports deadlines from dockets. Docket Alarm now identifies deadlines from dockets and automatically displays them when users view docket sheets. Beginning today, the deadline display feature is included as a complimentary addition for all Docket Alarm users. Deadlines are now integrated directly into the award-winning Docket Alarm litigation management suite. Dates are extracted directly from docket sheets as well as the underlying documents, making it easier for litigators to see upcoming events. Deadlines are also searchable – users can find cases with a specified type of deadline. 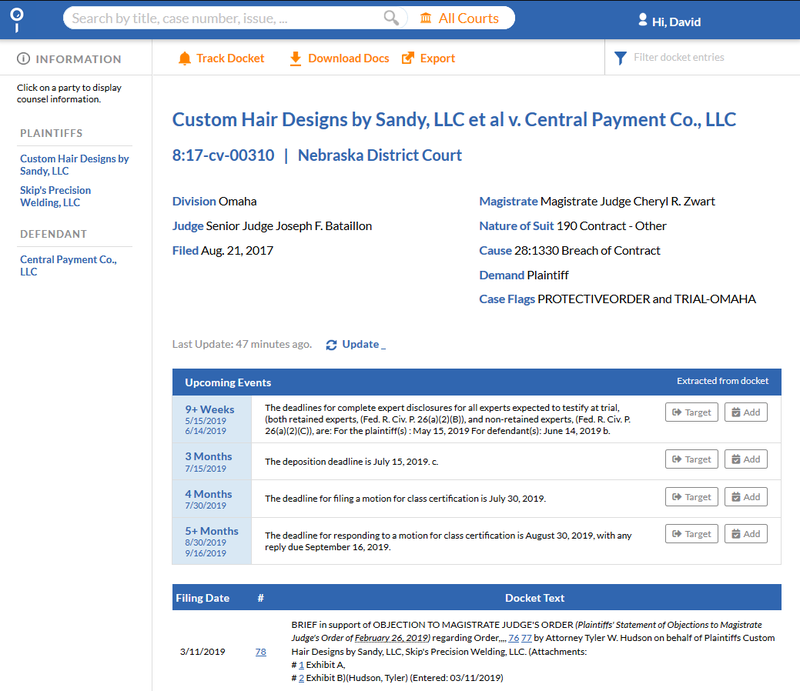 For example, a user can search for every upcoming construction claim hearing in a court, get a list of a firm’s deadlines, and find upcoming motion hearings before a judge. Litigators and litigation support companies will find this feature beneficial for strategy and finding new business. Thousands of litigators and law firm litigation support specialists at AmLaw 250 firms across the U.S. already rely on Docket Alarm to manage timelines, cases, run custom analytics, and conduct research. Now, users can incorporate the Deadline Display feature to manage their calendar and keep track of important deadlines. Deadline display helps users not only save time, but plan for the future. In two clicks, users can generate premade Outlook or Google Calendar events with all pertinent information. Docket Alarm continues to be a disruptor in the legal marketplace. Since being acquired by Fastcase in 2018, the company has expanded its coverage to 17 state courts and more than 250 million legal documents. It recently extended its coverage with the addition of four county courts: Bexar County in Texas, Fulton County in Georgia, and San Francisco and Ventura Counties in California. In addition to coverage of administrative courts and the entire federal court system via PACER, Docket Alarm also incorporates analytics in the Patent Trial and Appeal Board (“PTAB”) and the Trademark Trial and Appeal Board (“TTAB”). Judges at New York Legalweek 2019 recently recognized Docket Alarm with the prestigious national Product Innovation Award. Docket Alarm’s Analytics Workbench has created a new category in legal analytics. The Analytics Workbench empowers lawyers, librarians and other law firm “makers” to create their own reports across Docket Alarm’s entire 250 million record (and growing) dataset. Users can capture and analyze legal events that remain hidden in traditional offerings – such as revealing trends about discovery motions, motions in limine, scheduling and pre-trial conferences, at both the state and federal level, that would be impossible for traditional, read-only analytics. Docket Alarm is a research database that lives alongside Fastcase, enhancing the research experience. Its unparalleled database allows users to search millions of lawsuits, track cases on any device, and analyze outcomes for competitive advantage. Litigators, law firm “makers,” librarians, and litigation support professionals now have access to an unrivaled database to build their own bespoke litigation analytics across any court, practice area, or litigation event. Accessing Docket Alarm’s database and the Analytics Workbench tool in conjunction with the Fastcase legal research library, which includes exclusive integrated products such as such as Full Court Press publications, artificial intelligence tools within the AI Sandbox, and access to licensed secondary materials through James Publishing and Wolters Kluwer/Aspen/CCH, affords legal researchers with extended capabilities and more access to legal data for creating custom analytics. Docket Alarm continues to grow in popularity among today’s law firms, with a growing number of AmLaw 250 firms using Docket Alarm for litigation management and legal analytics. For a free trial and more information, visit www.docketalarm.com or connect with the Docket Alarm team attending the PTAB Bar Association Annual Conference on March 15 and 16 in Washington, DC. Docket Alarm is a national leader in docket research and legal analytics. Docket Alarm leverages a library of hundreds of millions of litigation records, as well as unique machine learning and natural language processing tools. The Docket Alarm API gives firms and companies the ability to leverage a giant database of PACER cases, alerting capabilities, and analysis in bulk. Docket Alarm was acquired by Fastcase in January 2018, and continues to be a disruptor in the legal analytics market.